Update: This social functionality is being sunsetted. Read about our new direction. Connect to your LinkedIn or Facebook networks using this icon. Gmail is coming very soon. Then we’ll work on Twitter and Outlook. Don’t worry, this step does not message your contacts in any way. When the process completes, click this icon at the top. Then choose My People via the universe picker at the left to focus just on your contacts. You can also try clicking Everyone (includes fellow beta users). Great! 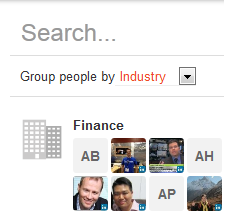 now you can search and group your contacts by Company, School, and Industry, sorted by number of people. We still have some tweaks to make in this area, but it should give the idea of where we’re heading. Alright, now let’s make a post to a few people from your network. If you linked your network(s), the people will appear in type-ahead. (We will soon be building support for adding additional people based on email address.) By posting to them, you are giving them access to our beta. Thanks! Your contacts don’t have to join yet another network in order to comment on your post. 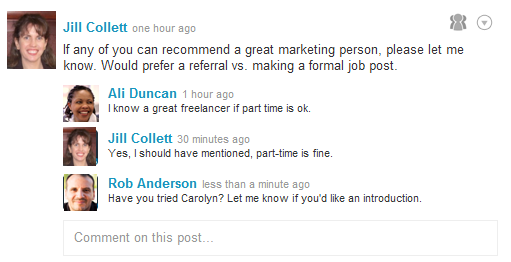 They will get a link via a private LinkedIn or Facebook message (or soon email) and they can use it to reply. Please note: We carefully limit the number of messages that go out, and instead rely on periodic digests. The default for non-members is a limit of one alert per week. Guests and members alike can comment on posts to create conversations. Much better than clogging inboxes with reply-to-all chains, isn’t it? Now that you’ve seen the basics, you might want to organize the contacts who matter most to you. 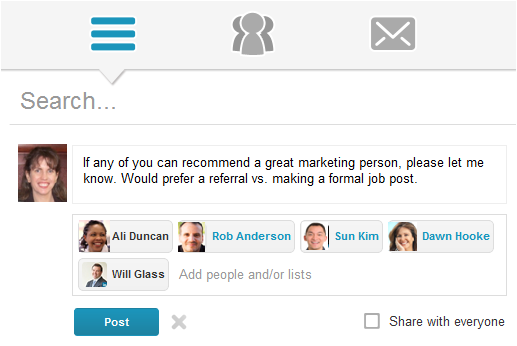 Once your lists are set up, it’s even easier to share relevant content with exactly the right set of people. You can also use lists to filter posts, people, and messages. Coming soon: Quickly adding people to lists via their picture. Well, that’s it for now. We look forward to your feedback. And please spread the word!